Magic Cabin Exclusive - The HugglePod HangOut Special includes both our HugglePod HangOut and the Crescent Stand together. 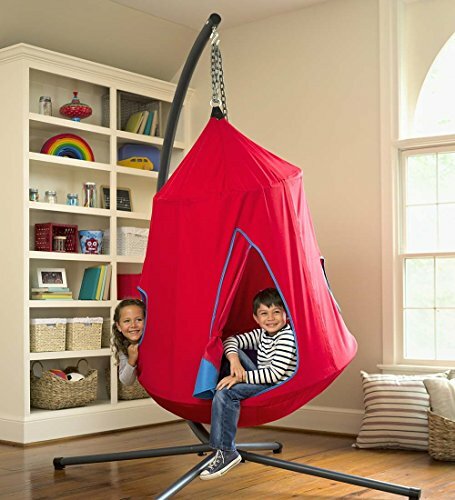 We developed this cozy hanging HugglePod HangOut to be roomy enough for kids to climb inside and hang out! With three porthole-style windows, a Velcro® flap door, and a plump removable cushion that' s stuffed with polyfill made from recycled water bottles, it makes a comfy spot to play, read, listen to music, or simply snuggle. A string of LED lights adds ambiance with an easy-to-reach on/off switch. It' s made of heavy-duty 100% nylon canvas and includes a reinforced metal ring for suspension, so it' s ideal for indoor or outdoor use. Imported. Spot clean only. Assembled in the USA of imported materials. String lights require 3 AA batteries (not included). String lights should not be left outdoors. For ages 4 and up; up to 250 lbs. total weight. Sizes: HangOut: 54"H x 44"W, Stand: 48"W x 48"D x 84"H. Color: Red. If you have any questions about this product by Magic Cabin, contact us by completing and submitting the form below. If you are looking for a specif part number, please include it with your message.